Summer is nearly here, though the weather has been pretty nice in Portland for quite some time now. We finally cleaned our little grill and got it in tiptop shape for summer. Since then, we’ve been grilling burgers regularly and love eating this classic summertime coleslaw alongside. I’ve actually made it twice in less than one week (it makes a big bowl too). We mainly like eating this slaw with burger patties, but it’s awesome with chicken too. I even ate it with eggs and sausage the other day! It seriously tastes great with nearly everything and I’m a big fan! Be sure to taste the dressing as you go and adjust the flavors to your liking. 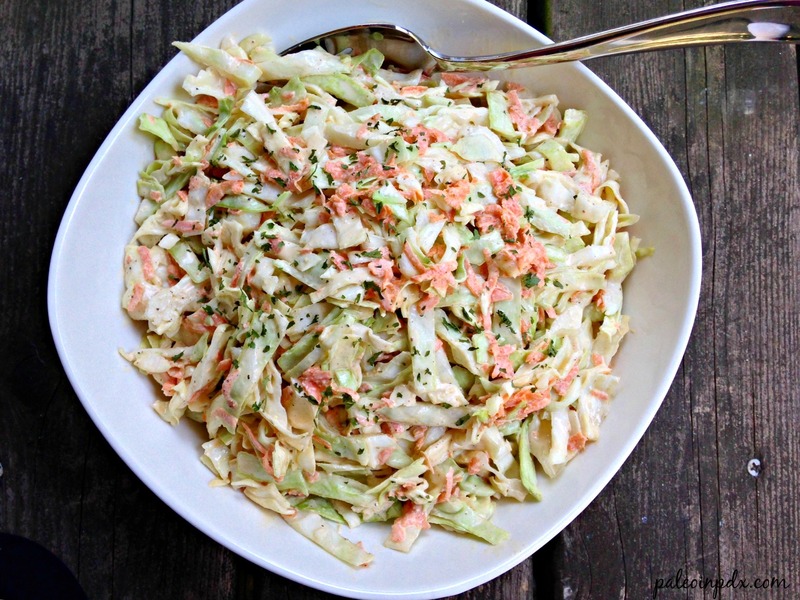 The coleslaw tastes even better the next day and the flavors are much more abundant. Also, I recommend making the homemade mayo with avocado oil for this salad, as the flavor is a little more neutral (though the macadamia nut oil version in my recipe link is awesome). Place cabbage and carrots in a large bowl. In a separate medium-sized bowl, mix together the mayo, vinegar, raw honey, mustard powder, celery salt, sea salt and pepper. Taste and adjust flavors as desired. Pour dressing over cabbage and carrots, and mix well to coat. Place in fridge to chill for at least an hour, but longer if possible. Taste and add more sea salt and/or black pepper, if needed. I love the summer slaw here in Oregon and usually buy it from Haggens Market to go with what is coming off of the grill. I love a good coleslaw and seeing your recipe reminds me of a great use for the jar of celery seed I always forget about!! I need to whip up some homemade mayo and make this coleslaw. I’ve made the mayo with mac nut oil–it’s awesome! I’m sure it is awesome with the mac nut oil mayo. That stuff is heavenly! I was just going for more neutral than nuttier with this one, but you could definitely use that version if you wanted to.